The TS Series is meant to make your life easier. Experience easy ribbon and media loading with this budget-friendly desktop printer series. 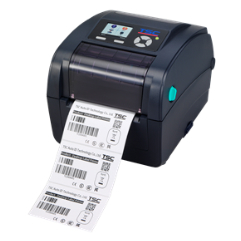 The TC Series is a desktop printer line from the trusted TSC Printers. Many describe the TC Series series as “the perfect fit”, featuring four models to meet various budgeting and applications. The printer’s dimensions are suited to fit in a compact and tight office space. You can find this series in Point-of-Sales, Product Marketing, Asset Tracking, Patient Tracking, and other similar applications.